One-time West Durham branch for the Fidelity Bank, headquartered in downtown Durham, this Rose and Rose designed neoclassical structure became a Wachovia branch when Wachovia absorbed Fidelity in 1956, and, after the construction of a new Wachovia branch across the street, long-time home to Bruegger's Bagels. In the last photo, the classic lines of the elegant building are obscured by...what the Hell?...FIFTEEN newspaper racks? There's gotta be a better way. Cool post! I've eaten at that Bruegger's and I enjoyed reading the history of the building. Thanks! I remember going into the bank as a child in Durham in the 1970's. I always wonder what happens to the vault of a re-purposed bank building. I agree with Lynn about the newspaper racks. Not only those, but the ugly power & cable lines. Isn't it about time that utilities are required to put those lines underground instead of stringing more from the poles? I've noticed a lot of ugly power lines in a many of the Durham photos. It's time to clean up the landscape. It's a shame that the large architectural window above the front door was lost. A tremendous daylighting feature that mirrored the long lines of the rest of the building's fascade. Wow, you mentioned Steve's Ice Cream! I remember going there as a kid and they had the huge mural on the wall. I can't remember exactly what was in the mural (cityscape? ice cream toppings?) but the ice cream there was good. Memories! A long-time West Durham resident told me that Andy Griffith performed at a Christmas party here for bank employees (early in his career). The highlight of the party was an early rendition of "What it Was Was Football." Joseph H, The vault is still in the creepy basement with its door left permanently ajar so no one can lock themselves in. When Brueggers first opened they used the basement for dough production. Now, there's the old coal chute, a sump pump, some old equipment and a rotting wooden floor in the basement. No ice cream place since Steve's has ever been as good. Their banana rum, barhumba, was awesome! I realize it's been a year since any comments here, but I thought I could remember buying bagels on 9th st. in the very early 70s and I thought it was in this building. Was Bruegger's somewhere else on 9th before being here? Tip Top Cycles bicycle shop moved into the Tre Bella location in 2012. 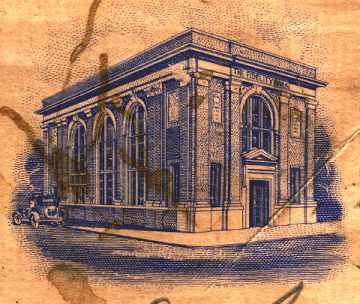 The Fidelity Bank was one of Durham's earliest banks, organized by MA Angier, George Watts, Washington Duke, and Benjamin Duke in 1887. After stints in the Wright Building and Trust Building, the Fidelity became the anchor tenant in the Fred C. Geer Building in 1915, which would house their main offices and main branch. They would eventually own that building and rename it the Fidelity Bank building. Unlike many other banks, Fidelity did not undertake an aggressive geographic expansion; under the Fidelity name, the bank peaked with 3 branches, all in Durham. 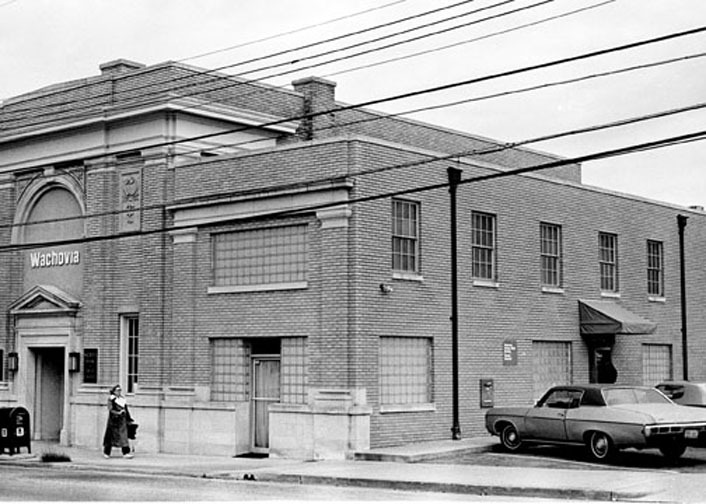 One of those branches, established in the early 1920s , was the West Durham branch. (The others were in East Durham and North Durham.) Designed by Durham architecture firm Rose and Rose, the neoclassical revival structure established an architectural presence on the south side of Perry Street. This corner had high visibility to trolley traffic, as the trolley made its right turn from 9th St. at Perry to get to Broad Street, where it would then turn left to head north towards Watts Hospital. 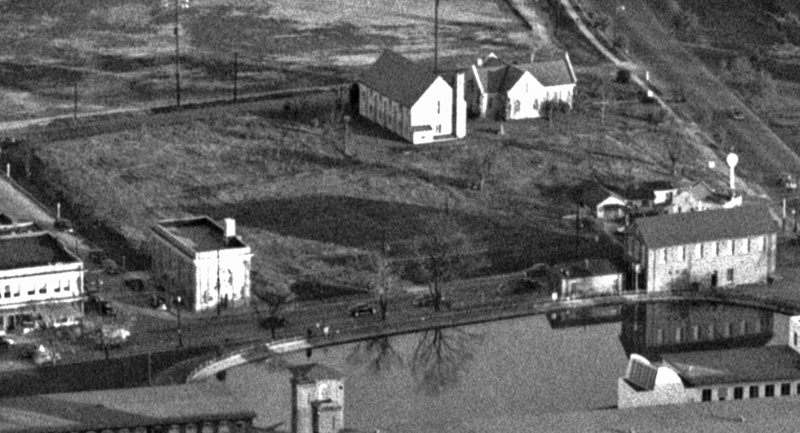 Fidelity Bank became a part of Wachovia Bank in 1956. The branch banks became Wachovia branches at the same time. The bank was expanded to the south in the 1950s - I'm unsure when. This remained a Wachoiva branch bank into the 1980s. Wachovia branch bank at 9th and Perry, 1980, showing the south side addition. 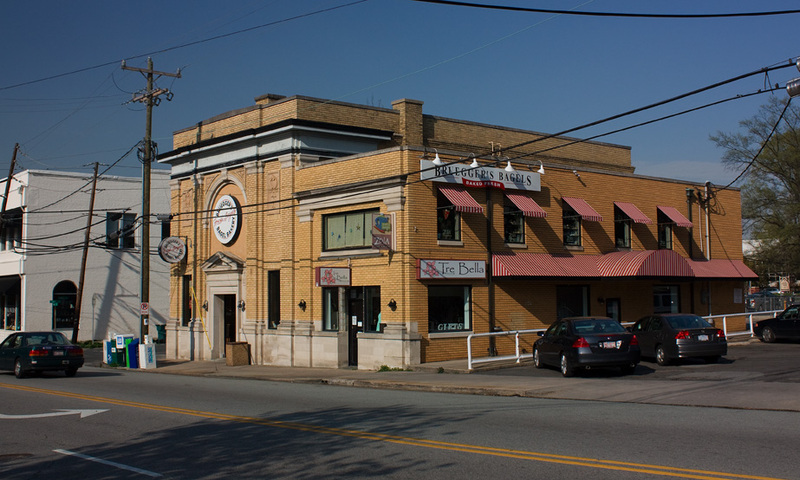 In the early 1980s, Wachovia built a new branch across the street, at the former location of the Erwin Mills company store/West Durham post office. The building was renovated, with Bruegger's Bagels establishing one of their bagel shops in the original bank building during the early renaissance of 9th Street. 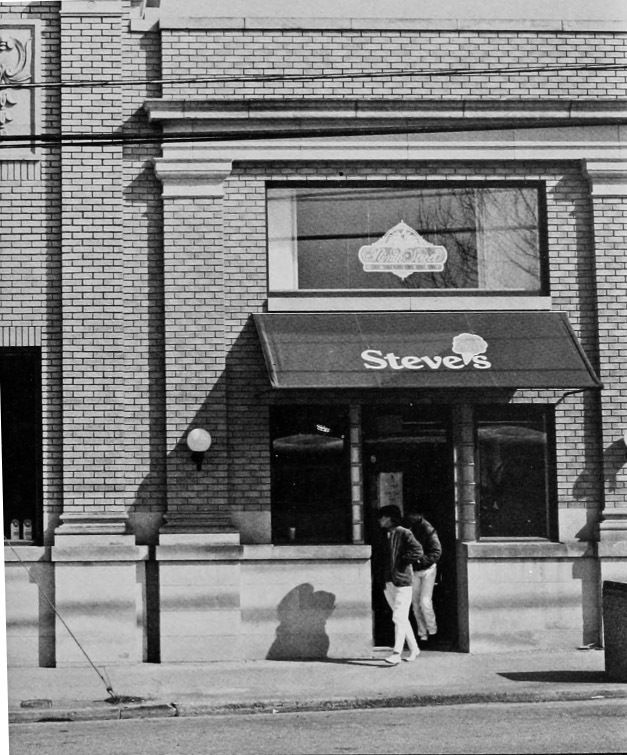 The first tenant I remember (from the late 1980s) in the southern addition was Steve's Ice Cream. Bruegger's remains, 20+ years on. The south addition has turned over multiple times, and is currently Tre Bella. Zola Gallery has an upstairs space on the second floor of the original bank building and south addition, with an entry off Perry St.